Slice your pie (and even other food such as pastry dough, tortillas, biscuit dough, etc.) with these handy pizza cutters. An easy favorite, this cutter checks all of the important boxes. The sharp blade on the 4-inch wheel cuts easily through crisp or chewy crusts, and it’s large enough to handle thick pizzas as well as thin. The handle-free design puts your strength right on top of the blade, making cutting nearly effortless, whether you use your left or right hand, and the non-slip grip at the top makes sure you can hang on, even if your hands are a little wet or greasy. For easy cleaning, the cutter snaps open, so you can make sure there’s no bits of cheese or sauce remaining in the nooks and crannies, and you can toss it all into the dishwasher when you don’t want to hand by wash. For storage, this pizza cutter includes a blade guard so you can toss it in a drawer and not worry about accidental cuts when you’re rummaging in the gadget drawer for your favorite peeler. This wallet-friendly cutter works well and is inexpensive enough to keep at a vacation home or take to a potluck without worrying about leaving it behind, yet it does the job well. The blade is 4 inches in diameter, so it’s large enough to cut either thick or thin pizzas, and the plastic handle is durable and easy to hold. For easy cleaning, it’s dishwasher safe, so you can simply toss it in with all the other gadgets and utensils. While buying a pair of specialty scissors specifically made for cutting pizza might seem just a little bit extravagant, these scissors have one major benefit over other styles of cutters. 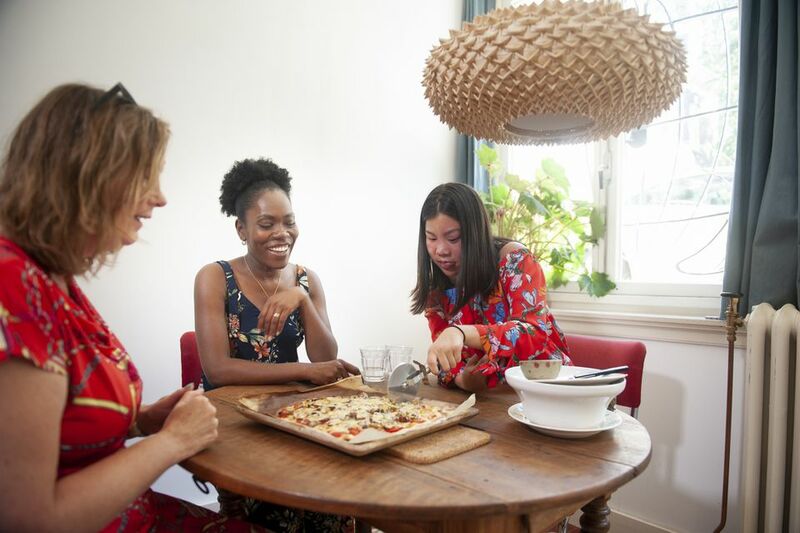 They can be used on any surface, including on delicate nonstick pizza pans or serving platters, so you don’t have to transfer your pizza to a cutting board for portioning. These scissors are designed so the bottom blade slides easily under the pizza, with a nonstick “shoe” that protects the surface below. That nonstick shoe is heat-safe to 400 degrees, so you don’t need to worry about it melting when it makes contact with the hot pizza or pan. The familiar scissors action slices neatly through crust and toppings without putting pressure on the pan or plate below, so you’ll never scratch your pizza pan or mar your favorite pizza stone or crack your favorite serving plate. ﻿These scissors can also be used for slicing any thin breads like focaccia or tortillas. When cutting is done, these are dishwashing safe, so cleanup is a snap. Made from a single piece of metal with no hinges, joints, or moving parts, there’s very little that could damage this cutter. At 11 inches long, it will slice easily through medium-sized pizzas with one motion or slice through giant pies with just one move to a new position, yet it will fit in most kitchen drawers. The rolled top edge provides a firm handhold anywhere along the top of the cutter and keeps both hands away from the blade. For easy cleaning, this is dishwasher safe, but it’s just as easy to wipe the blade clean while you’re washing your knives. 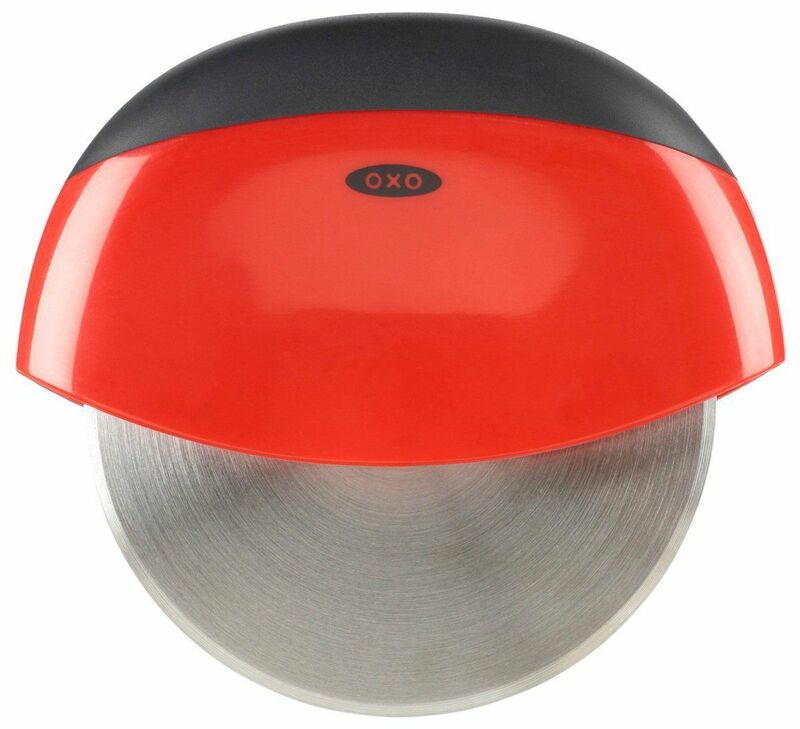 If you own other OXO Good Grips tools, you know how easy they are to care for. Just use them, toss them in the dishwasher, and put them away once they’re clean. This pizza cutter is no exception. This cutter has a 4-inch wheel that can cut through thin or thick pizzas, and it has a sharp blade that can handle any crisp or chewy crust. A diecast thumb guard keeps your thumb out of the way of the blade while it also allows you to apply extra pressure while cutting. The handle is similar to those on other OXO tools, with a large, soft-feeling grip that’s easy to hold onto, even if your hands are wet or greasy. When pizza making is done, this will also come in handy for cutting pastry or pasta dough as well as other types of thin breads. Made entirely from stainless steel, and with a forged rather than stamped handle, this cutter is both durable and beautiful. Winner of a design award for the all-metal structure and the ergonomic handle, this has a mirror finish, an elegant-looking handle, and a curved thumb guard that will keep your fingers away from the blade. It’s not all about looks, though. This cutter has a hand-sharpened blade and is made by a company known for its knives. Like quality knives, hand washing is best, but this should also withstand cleaning in the dishwasher. For storage, this includes a blade guard to protect both the cutting edge and your fingers while you’re searching your gadget drawer for your favorite peeler. The design of this wheel-style cutter is truly unique. Made by a German company that’s been making innovative cooking tools since 1888, rather than having a solid wheel, this cutter’s wheel is shaped more like a donut, with a large center section removed. This allows you to hold the cutter with your fingers curved inside the blade for a more comfortable grip, and it lets you cut easily while pushing straight down or at an angle. For easy cleaning, the wheel comes apart, so you’ll never have bits of cheese or sauce hidden inside. While this can be washed in the dishwasher, the plastic housing and super-sharp blade are probably better washed by hand to preserve their life. The long 14-inch blade and two top handles give you the length and strength to cut large pizzas in one neat rocking motion. Shaped like the smaller mezzalunas that are used for mincing herbs, this gives great control and allows fast rocking, in case you’re ever faced with a large pile of herbs or vegetables that need to be minced. The length also makes this great for cutting bar cookies, brownies, and even sheet cakes as well as smaller items like tortillas and thin breads like focaccia. When it’s time to clean up, this is dishwasher safe, but might be easier to wash by hand because of the size and shape that might not fit well in all dishwashers.